I'm not sure how popular Groundhog Day is in other parts of the country, but here in Pennsylvania, you just have to have some type of celebration. Since Pennsylvania is the home state to good old Punxsutawney Phil, the day just can't go unrecognized. 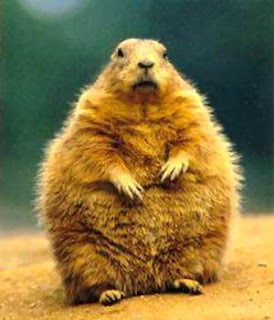 This year we are not at school on Groundhog Day, but I am still going to do some activities with the children. We focus a lot on the shadow aspect of the day. I have everyone bringing in a flashlight and we are going to go around the school making shadows and just having a good time with the flashlights. Groundhog Day used to be Candlemas Day--which was the day the Holy Family visited the Temple. Europeans believed that the weather would change six weeks after February 2. Hibernating animals would come out on this day to "check out" the weather. They focused on a badger as their animal. If the badger saw the sun, he was scared by his shadow and ran back in his hole for 6 more weeks. If the skies were cloudy the badger would stay outside and winter would soon be gone. The Punxsutawney Ground Hog club was established in 1898. The groundhog's big scene takes place on Gobbler's Knob. Here's the one part I always forget--If the groundhog sees his shadow he will become frightened, run back inside and we will have six more weeks of winter. If the groundhog does NOT see his shadow, he stays outside and spring is right around the corner. Here's a site with some information and activities: http://www.groundhog.org/teachers/. I was just thinking about that today-being born and raised in PA- Phil is so popular, so I was wondering if other areas in the country celebrated like we do! I actually thought about going up to Punxatawney, but my daughters looked at me like I was crazy. They said too far of a drive and what if Phil get's loose. Ha, Ha. Kids are too funny!! ps Go Steelers!! 6th SuperBowl! !